Fun and flirtatious Leo heats things up as the most expressive sign of the zodiac! Ruled by the vibrant Sun and driven by the warmth of its Fire element, the charming, magnificent, and dramatic Lion is the life of the party and loves attention. With its shining heart of gold, Leo is a loyal lover and a proud and courageous leader. This sign of the Lion embodies an air of royalty, just like the kings and queens of the jungle. Sometimes expressive to a fault, Leo has never been known to keep its feelings hidden! Steer clear of Leo’s drama, and you’ll find some of the most generous souls you’ll ever meet. 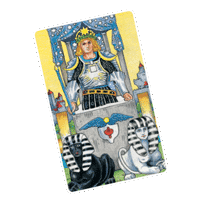 Leo’s is empowered by its Tarot card, Strength. 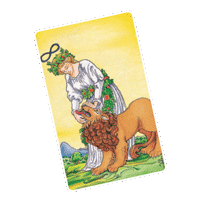 In most Tarot decks, a Lion is featured prominently on this card, representing an obvious relationship with Leo the Lion. This card embodies nature in its most primal form, allowing the Lion to be and to express its true self. The Strength card is not only about physical strength, but also about strength of heart, mind, and soul. This card reminds Leo to balance its brute force and powerful roar with compassion, generosity, and love. The zodiac sign Leo is represented by the brave and mighty Lion. While its glyph appears as the head and tail of a Lion, it also represents the Greek letter “lambda,” which is the first letter in the word “Leon,” meaning Lion. The Lion is known most for its strength and bravery as it rules over the jungle as one of the most powerful animals. The sign of Leo mirrors many aspects of this magnificent and royal feline, like instinct, affection, strength, and bravery. The emotionally charged Moon rules over the sensitive zodiac sign Leo. In Astrology, the Moon has a powerful hold over the human emotions, while Leo is a tender sign driven by feelings and desires of affection. The sign Leo embodies its lunar influence by taking responsibility for and prioritizing the feelings of those around it before all else. Let the Lion loose! As the fifth sign of the zodiac, warm-hearted Leo rules over the 5th House of Pleasure. Both playful and full of energy, Leo the Lion feels right at home in this house that’s all about fun, creativity, and expression. And thanks to Leo’s frisky, flirty ways, this house also holds great clues to your romantic life, and the rewards love holds for you. 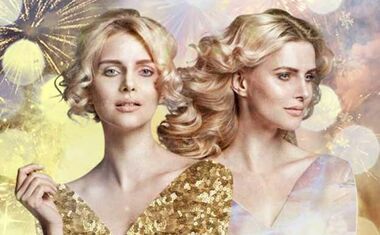 Leo is a Fire sign that shines as the center of attention wherever it goes. The element of Fire ignites Leo’s desire for life, drive for love, and eagerness for action. Like a roaring bonfire, Leo’s energy radiates warmth and lights up even the darkest nights. 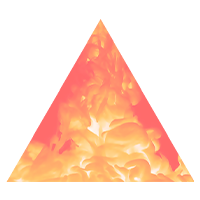 All it takes is one little spark to set Leo ablaze with with bold expression, brave choices, and powerful confidence. Regal and bright, gold is the color for Leo the Lion. Glistening with royalty and class, gold has always been a symbol of power and prestige. So it’s no wonder Leo -- the King of the Jungle -- is represented by this expressive shade. When caught in the light, gold will glisten and shine so brightly it’s almost blinding. Just like Leo’s flamboyant nature, the color gold oozes with warmth, positivity, and attention. Leo’s Fixed quality shines as the second sign of the summer season. In the scorching light of the mid-summer Sun, Leo lets its rugged side surface in order to move through the season. Leo’s endurance and unwavering self-confidence carry us through the longest and hottest days of year, while keeping us optimistic for all that’s still to come.